We invite you to mother the mother. Yoga for you helps strengthen and tone your full abdominals, pelvic floor, and lower back and to relieve tight shoulders from feeding, bathing and, carrying. Yoga for bub helps coordination and gross motor skills, and aids in digestion, constipation and helps relieve gas and colic. 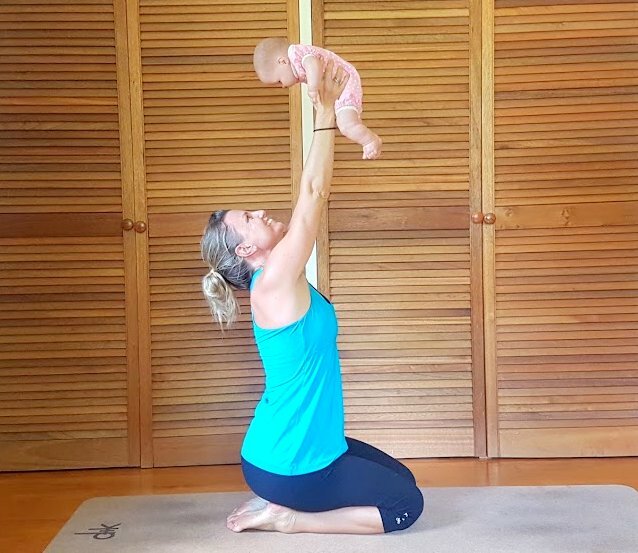 Baby Yoga creates a balance between strength and flexibility in developing bodies, so they grow strong and maintain the flexibility they are born with. Most of all it promotes bonding between mum and bub and provides a space for mums to give back t themselves, while connecting with other mums to create a sense of community. The nurturing and supportive class environment helps women overcome any emotional challenges as they transition into motherhood. The post-yoga practice feeling is the same as visiting a spa; nourished, serene and light. It allows you to nurture your body and soul. We encourage you to look after your baby’s needs, to change and feed your baby anytime during the class. Our classes evolve each week as the babies develop and as needs are met. Have no expectations – just enjoy the evolution, sometimes chaotic, always calming. There is free and easy car parking nearby! Private classes are available at your own home or our choice of studio’s.